A family judge from Normandy decided not to put her feet up and relax when she retired. Instead, she created a special bus service which moves from town to town, and welcomes people who wish to chat about problems they are facing in their daily lives. It is a drop-in centre on wheels which covers the whole of the Manche department. Catherine de la Hougue, 70, discovered this need from her work in court and felt that many situations could be diffused if only people had someone to talk to and someone who would listen to them in a relaxed and neutral place. The Manche is a narrow, rural department with a poor road network and public transport and she realised people could not access help easily, so the best idea was to take the help to them. Her bus, which has been running for two years, stops at a different town every day of the week, apart from Sundays, and there is a strict rota which coincides with market days and means that people know when it will be present in their area. The idea was not, however, an immediate success. It took three years to raise the money to set up and at first it was difficult to attract people up the steps of the bus: “My original idea was to provide this service for families,” said Mrs de la Hougue. “At first we parked in front of schools. Since then there has been a steady stream of people: “It is there for everybody, not just those who might normally be seen as needing help. “It is for professional people, those on low incomes, teenagers, parents, older people, everyone. Life can be difficult and it is a place where you are allowed to admit that that is the case for you. We are neutral and all information is confidential. “Several grandparents come to see us because they often have a great deal of responsibility in looking after their grandchildren while the parents are at work and are not sure how to deal with them. We also have a lot of parents who have problems with their children. Children suffer a great deal from family break ups and teenagers come to talk to us about that. “What is important is to be able to talk to someone before feelings which have turned bad develop into hate. 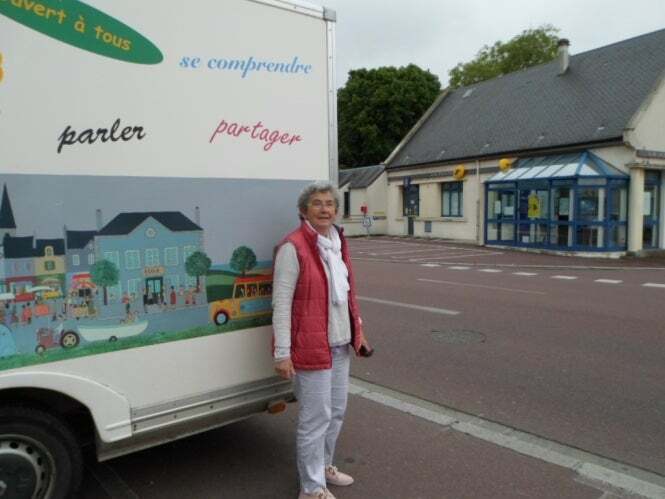 Mrs de la Hougue said that after that slow start, she was surprised by the success of the bus: “I didn’t think it would be used by so many people, but I think life is becoming more complicated and though there is a lot of mass communication and chatting on social media, many people are very isolated. The ‘listeners’ do not give advice, though they may point someone in the direction of a professional service if the person talking suggests themselves that this might be a solution. Mrs de la Hougue thinks her idea would be welcome in other rural parts of France. Parentibus (www.parentibus.net) is working to raise the funds it needs to keep offering its vital service. There are art auctions, cabaret soirées and finance is always an issue. It all means that Mrs de la Hougue is leading an active retirement while helping others out.